Last week, AT&T announced lower pricing options for their contract subscribers by splitting device subsidy costs from service plans. This seems like a direct result of T-Mobile's move to eliminate subsidies and slash contract prices. This move should have major repercussions for operating margins at carriers and the sales of premium smartphones. With this announcement, it is becoming increasingly clear that the basis of competition among US carriers is shifting. Previously, large carriers like AT&T and Verizon could leverage their service quality to charge higher prices. But as service quality has improved, the basis of competition (starting with more price sensitive customers) is shifting to price and flexibility in contract structure. As a result, low-end disruptors like T-Mobile have been able to challenge the status quo. With the threat of increased subscriber churn, leading carriers like AT&T and Verizon have no choice but to follow suit in this "race to the bottom". 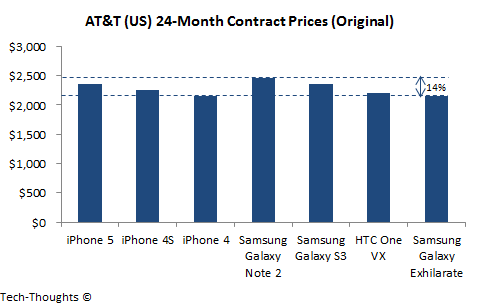 On contract, the most expensive smartphone was previously just 14% costlier than the cheapest. 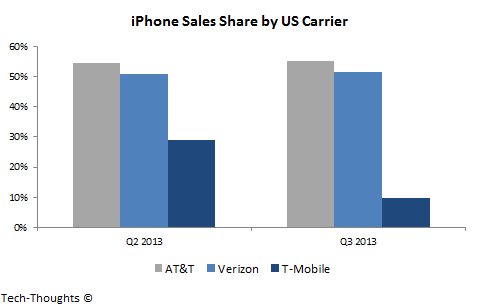 This disparity has now grown to 37%, which is similar to the disparity at T-Mobile. 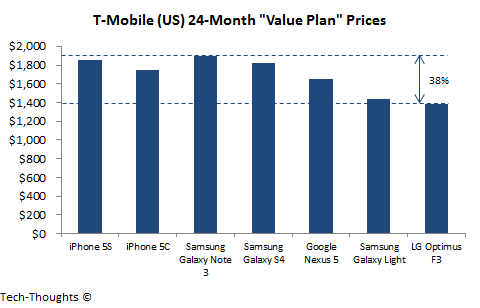 We already know that premium smartphones owned a lower sales share at T-Mobile in Q2 and Q3 2013, as compared to AT&T. 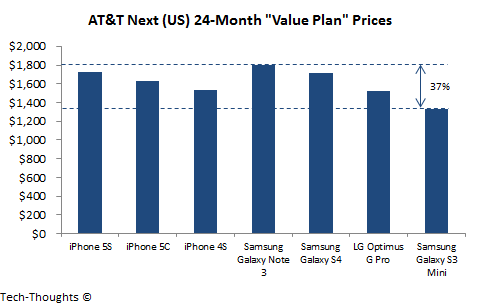 This was undoubtedly a result of greater pricing disparity between premium and mid-range smartphones. As other major carriers begin to adopt this model, the market is likely to begin shifting from premium to mid-range smartphones as well. More precisely, a change in pricing from the Tier-1 model to the Tier-2 model is likely to cause the basis of competition in the US smartphone market to shift.